This is the penultimate (or that is the plan!) in a series of posts I am making following a four-day course with Iain McGilchrist. Details of the course, which will run again next year can be found on the Field & Field website. In this session Iain discussed the value of saying ‘No’, which I took to mean saying ‘No’ to the dominance of the left hemisphere’s view of the world, and referred us to others who have said this before in a variety of ways. Many ideas were referenced and my notes feel like a list of references that should be followed up, but they all relate to ‘The Power of No’ and the role of negation in creativity. Because what follows feels to me a bit disjointed, I have tried to pull out the key messages (at least the key messages for me) in bold font. There are two choices – saying ‘no’ and ‘not saying no’, in order to say yes later. Iain told us that capitalism wants us to be ‘doing’ and saying ‘Yes’. However, there are things being done that should not be done and we should give more thought to not doing things. We need to stop, attend and listen to what emerges. ‘No’ comes prior to ‘Yes’. (Here, I need to stress again that this course was not about politics or religion, but much of what was discussed could be applied to our understanding of both). Wisdom from the Greek philosophers onwards is associated with not knowing (e.g. Socrates), which should not be confused with ignorance. ‘Do nothing and there is nothing left undone’ is a pearl of ancient Chinese wisdom inspired by chapter 48 of the Dao De Jing (Tao Te Ching) written by Lao Zi (Lao Tsu) (See Shawn Cartwright, Yinong Chong and Ted Nawalinski’s website). 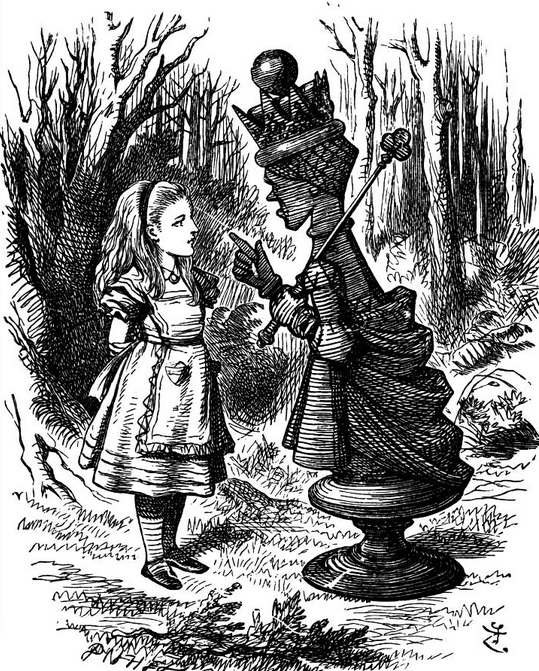 ‘I think I’ll go and meet her,’ said Alice, for, though the flowers were interesting enough, she felt that it would be far grander to have a talk with a real Queen. Alice achieved her goal by taking an indirect route. Negation is important in not doing the obvious and not taking the direct route. This has also been written about by John Kay in his book Obliquity: Why our goals are best achieved indirectly. Systems theory thrives on obliqueness and may provide a language with which to explore otherness (See references to Peter Checkland and Donella Meadows). Parsimony and not wanting more and more (which the left hemisphere might drive us to do) may be better than striving to get hold of more things. The strategy of delaying or taking an indirect approach can be seen throughout history, with the classic example coming from the Roman dictator Fabius Maximus and his avoidance of frontal assaults in favour of a war of attrition. William Ophuls in his books ‘Immoderate Greatness’ and ‘Plato’s Revenge’, also takes up this theme that civilizations thrive better without grandiose schemes. (See also ‘The Blunders of our Governments’ by King & Crewe). There is a strong relationship between quantity and quality; more is not better, as we can see in what tourism is doing to some places on our planet. We can also see the relationship between negation and creativity in Genesis in the Bible. As mentioned in a previous post, the story tells of a world created by taking things apart. John Keats was the first person to use the term ‘negative capability’ to describe this capability of tolerating uncertainty, doubt and ambivalence. Familiarity has a deadening effect but negation unleashes things and opens them up. Wordsworth used negatives and comparators in his poetry especially in the poem Tintern Abbey. The principle of ‘negative capability’ – the capacity to be uncertain and think beyond presuppositions – is important for tolerating ambiguity and not closing things down. According to the Kabbalah the first act of creation is often ‘withdrawal’, followed by ‘shattering’ and then ‘repair’. This website explains this in more detail. Also as mentioned in previous posts, things become clearer by being cleared away and our brains need to lose neurons to grow, which can be thought of as neuronal pruning. See also the reference to sculpture in my first post in this series. Like sculpture, good literary criticism also reveals, whereas bad literary criticism gets in the way, gets between you and the subject. ‘The Popperian criteria for truth incorporate the notion that we can never prove something to be true; all we can do is prove that the alternatives are untrue.’ (p.230 The Master and his Emissary). Sometimes less is more, although they can be very close and every ‘Yes’ brings its ‘No’. Asymmetry stems from symmetry and vice versa. … a reading from William Wordsworth’s Tintern Abbey , Iain’s favourite poem by his favourite poet. William Ophuls (2012). Immoderate Greatness: Why Civilizations Fail. CreateSpace Independent Publishing Platform. I just wrote notes for a blog post titled ‘No’. In buddhism we have practices of renunciation and sense restraint with this same intention. The world needs ‘No’ and is being run by human beings feeling entitled to both ‘Yes’ and ‘Right now’. Ancient wisdom knew human nature and our worst qualities as much as we do today, but perhaps the balance of power between ‘Yes and No’ has shifted to much to one side….